I wonder what would happen if our politicians and people would try a different kind of surge in Iraq and Afghanistan? One that involved less military and more social action. What if we sent thousands of volunteer teachers, doctors, and yes, politicians into the countries to help rebuild their infrastructures and to teach them what it really means to live in a free society from the grass roots? What if these people were willing to step into harm�s way in order to help others? Dangerous? Yes, but probably the only way to really develop a trusting relationship with ideologically opposed peoples. I wonder if things would have turned out a lot differently in both countries if after the first days of the occupation, we had spent billions of dollars on immediately rebuilding their societies. What if our top priority was building hospitals, schools and providing jobs, electricity and water? Expensive, yes, but not nearly as expensive as what we�ve gotten ourselves into now (I understand at over 200 million dollars a day now). I�d like to think that if the Iraq people saw us more without a gun in our hand and had been quickly given back their modern conveniences, even improved services, maybe they would not have been so susceptible to insurgency politics and anti-American sentiments. That is not to say anything disparaging about our fantastic military. They have done a wonderful job, given the ever changing atmosphere. But the military cannot easily win the hearts of a hostile people. Maybe a different kind of Surge could bring inspiration and hope to the Iraq and Afghanistan peoples, and restore our Country�s good name and reputation. President John Kennedy championed the space program. Consider the potential of your promotion of an undersea laboratory or colony. Image the challenge and rewards of developing the first serious human presence under the sea. A fully functional permanent undersea city. O.k., how about village? Challenge the world to develop a full scale undersea laboratory capable of housing up to 100 persons 24/7 year round. It would be placed in relatively shallow water (<100 ft) with future satellite stations at intermediate (>1000 ft) and deep depths (>3000 ft). Every generation looks for an inspiration, a goal, a challenge to strive for that does not necessarily arise out of some dire necessity. I�m talking about pure awe inspired �lets do this just to see if we can� goals, not because we have to. Leisure goals. I�m not talking about human rights, national security, health, economics etc. which are absolutely important, and transcend leisure goals. But my �leisure goal� label belies the great importance of such endeavors for the human spirit. Forty years ago, we had what might be argued to be a major leisure goal in the form of the space race. Yes, national security, etc. were all part of it. But I believe the real driving force was the same that drives us to climb mountains...that is just because its there and we can. It just took a great leader to inspire us to reach for the moon. I think that space exploration is still of great importance (yes I�m a star trek fan), but I think we are ready for another type of space race. Inner space. Exploration of the seas. When I was a kid, I saw a movie called �Hello Down There� in which a man invents an undersea house and has his family live in it for a month to prove people can live in the sea. When I was a kid, we all assumed that people would be living in undersea houses by the time we grew up. And I wanted one! That was in 1969 - four decades ago, and it�s a sad fact that we have barely even put a handful of scientists in the water much less developed underwater houses or real full-scale underwater laboratories. True, a small undersea laboratory was established decades ago in the Carribean (the NOAA Tektite project), but that program ended long ago. Today, the only manned undersea research laboratory in the world is the Aquarius lab in Florida run by the NOAA National Undersea Research Program. But as worthy as that program is, it is just an after-thought to the space program. A token undersea laboratory. And even there, the National Undersea Research Program has received only very limited funding in recent years, and a zero dollar budget this year! What we need is a leader who is up to the challenge of inspiring the nation and the world to work together and develop a real habitat for man in the sea. A real functioning undersea colony. Image all the technological benefits that such a program would bring. It would of course be important to instill into the program a great concern for the environment so that our first real colony in the sea does no harm. Are you up to the challenge of inspiring us to reach into the sea? Wouldn't that be a great legacy? 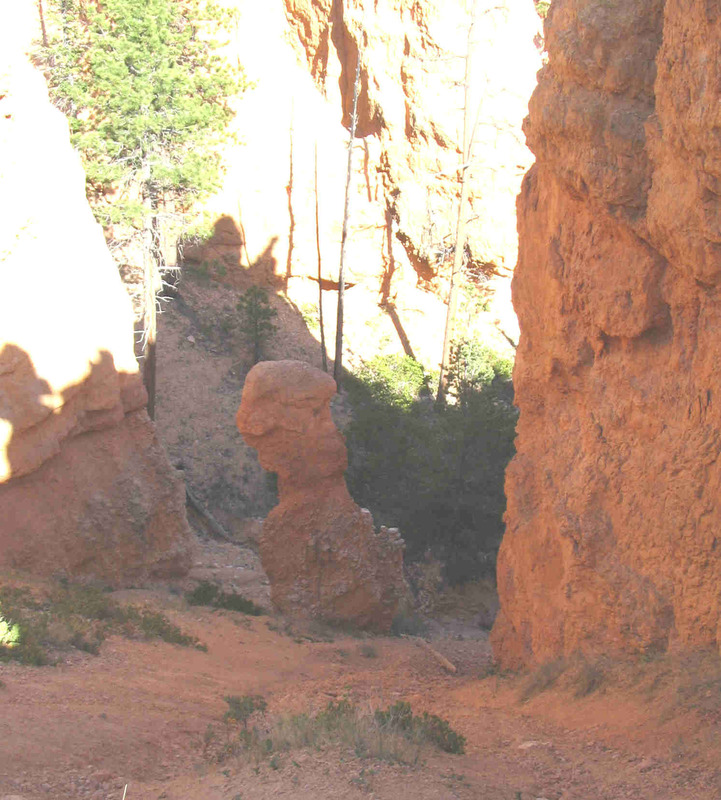 While hiking in Bryce Canyon this summer my daughter saw this hoodoo on the Queen's Garden Trail and thought it looked like Elvis (well, we had been hiking for several hours in 100 plus temps). She took some pictures and a European couple saw her and started taking pictures of the Elvis Hoodoo too. So we are hoping that we've started an underground movement to name this hoodoo after Elvis. Here's a challenge for you. If you have a chance to hike the Queen's Garden trail (its amazingly awesome), see if you an find Elvis and take his picture. We'd love to hear from you. I'm sure there are good reasons, but I wonder why we have to be constantly bugged with virus and spam prevention software at the level of each pc. My computer is constantly screaming at me to update anti spam and anti-viral software. Don't all virus containing programs have to exist on the internet somewhere, or pass through the internet on its way to my computer? Then why can't anti-virus software be placed on the internet host machines to intercept them BEFORE they get to my machine? Seems like that would be a lot more efficient and cheaper way to fight virus software. Instead of millions of people having to pay millions of dollars for very annoying software that has to be updated every time you access the internet and for which you have to pay for every year, the problem would be handled by the service providers and internet infrastructure. I wonder if use of flumes to construct rapids to drive turbines would be less environmentally damaging than dam construction. I'm way out of my field of expertise here, but that's one reason I started this blog. That is so I can ask stupid, but hopefully ultimately instructive questions. Anyway, it seems to me that beside the drowning of large areas, that Dams also seriously influence downstream transport of suspended sediments. This can have dire consequences for many riverine systems and associated fringing ecosystems and deltas (see for example issues surrounding the Narmada River in India. But what if we just diverted part of the river to a series of large flumes that created rapids sufficient to drive turbines? Seems that this would have less of an impact on sediment transport. I realize that these might be somewhat less efficient, but that could be largely overcome by building more of them. It might help out many of our anadromous fishes too. Three young farmers received grape vines from their fathers. They were all eager to raise vines with prize grapes. They carefully tended their vines, providing water and weeding as necessary. But one farmer considered only the branches and stems of the vine. He did not think about its roots which were hurt as he dug around the vine and pulled the weeds. The second farmer knew the importance of the root. He was careful not to damage them and to provide them with mulch and fertilizer. Unfortunately, the third farmer received a vine with no roots. Undaunted she said to herself �I will pray for God�s help and trust in him.� And so she planted the vine and cared for it as best she could. Despite his unwitting carelessness the first farmer�s vine did grow and bear fruit, but the second farmer�s vine grew better and produced more fruit. Likewise, because of her faith in God, the third farmer�s vine also put down strong roots and grew as well as the second farmer�s did. After a time, there was a great storm. The winds blew hard and uprooted many vines. Though the first farmer tried to protect his vine, it was lost. The strong roots of the other farmer�s vines anchored them against the storm and they lived. The farmers� are like three Christians seeking to grow in faith and spirit. The vines are their faith and the roots are the Church and the Bible. Although it is possible to grow in faith and spirit without roots (with God as your anchor), for most of us it�s better to start with good roots! A teacher sought to help her children learn that it is wrong to lie. She could have simply told them that lying is wrong and that they would be punished if they were caught. Instead she told them this story. Two kittens were each given a sardine as a special treat by their mother. When the mother left, one kitten ate his sardine while another went to get a drink. While she was away, the first kitten finished his sardine and, still being hungry, ate his sister�s sardine too. When his sister returned, she asked her brother where her sardine was. The brother was ashamed that he ate her sardine and was afraid he would be punished, so he lied. �A big dog came and stole it� he exclaimed! His sister cried and ran to tell her mother. The terrified mother came running back with the father. �Where is the dog� they exclaimed? �Are you all right?� Well the little kitten did not know what to say. Now he was really frightened. �He, he ran over to the neighbor�s yard� he finally stammered. �Stay here,� the father said. �I�ll go warn the others and check on the neighbors.� Soon the little kitten was surrounded by worried adults with lots of questions. �What did the dog look like? Have you seen him before?� It was all too much for the little kitten and he finally admitted the truth. �There was no dog� he cried in anguish. �I made it up because I ate my sister�s sardine�. Of course the parents were upset with their kitten. They explained to him that he had done a bad thing and had him say he was sorry to his sister, to them, and to all the neighbors. But of course, they told him they still loved him and said it was brave of him to admit the truth. After the teacher finished telling the story, she asked the children what they thought, and they discussed why the kitten lied and what the consequences were. In this way, each child learned for themselves why lying is wrong. And they remembered it. The Devil stood by a lake watching a child drown. A Christian happened along and the Devil said �Look a child is drowning, jump in and save him.� But the Christian was filled with fear and said to himself �If the Devil is telling me this, it must be a trap. If I jump in to save the child I will be eaten by a monster� and he ran off. Next another Christian came by and the Devil said to her �Look. A child is drowning. Jump in and save him.� But she too, reasoned that the Devil sought to trick her. �He wants me to save an evil demon and I will not� she said as she ran off. Next another Christian came along and the Devil repeated his request. This time the Christian said to himself �I know this is the Devil, but a child may be drowning.� And so he jumped in to save the child. Yet again, the Devil stood by a lake watching a drowning child. This time an atheist came by and the Devil said to her �Look. A child is drowning. Jump in and save him.� Not knowing it was the Devil who spoke, she jumped in to save the child. Which of these have done the work of the Lord?